First chose your clay colors. Marble a few colors together. Make a long snake & taper each end. Roll the snake into a round coil. Make a tapered log from another color. Place the two pieces together firmly. Take a small amount of a complimentary color and make a semi-circle shape. Place on top of the head. Add a flat strip around the seams (this will make an instant cloche hat). Add a few flowers or decoration to the snail shell & body area (this will offer additional support to the seam). Use a needle tool to insert eyes. Give your little snail a nose & mouth. Add decoration to your snail. 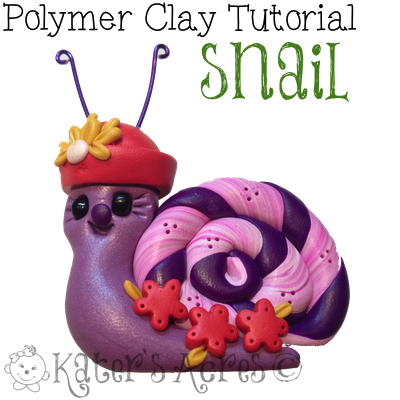 Bake in your polymer clay dedicated oven for 45-60 minutes on 275 degrees covered in foil.